Still Busy with Suicidals - Can you help us? Why Is Inmate Participation in Bible Studies So Valuable? Not all prisoners live behind the wall. Many live in prisons of their own making, including those trapped in a vicious, relentlous cycle of suicidal thoughts. As you may already know, the Christmas holidays are often a very depressing time for many people. Just since December 5, we have received over 50 requests from the Internet for David Wilkerson's Suicide book to be shipped to suicidals. The majority of the requests came directly from the United States, including Alaska and Hawaii. Three suicidals were military personnel. We also received requests from as far away as Canada, Guam, Latvia, Russia, and Switzerland. We spend a great amount of time, searching online church directories for ministers in these locations, so we can ask them to follow up these requests. Right now, we could use several online volunteers to match suicidals with local ministers for followup. If you'd like to help in this needy area, please let us know by e-mailing us. One suicidal called me last night to tell me the book clearly depicted suicidal progression exactly as she had experienced it. The further she read, the more she believed David Wilkerson knew her life like a book. Suicide provided her with clear Scriptural answers to the gnawing questions she has been asking for so long, both thoroughly convincing her of the sinfulness of entertaining suicidal thoughts and offering her a lifeline of hope. "I am going to be very brief with this letter. I am currently serving a ten-month prison sentence for a charge that I got two years ago. I was originally placed on probation when I first got this charge. I violated this probation a short time after receiving it. I eventually turned myself in and received my prison sentence. This all happened over a period of about two years. "I received the gift of life in Christ when I first caught this case, in 1996. I have had an awful amount of ups and downs that I could not explain and sometimes really discouraged me. But for some reason, what the Lord had given me, I could not let go of. 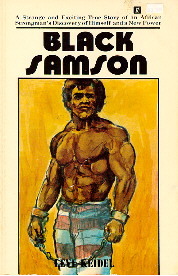 "I related my life very closely to Black Samson. I had been in prison before and was a person with many, many bondages. I think about the chains that I read about in this book. I never had physical chains like the ones he had on his neck, but I had spiritual chains that were just as real. I think that all Christians can relate in one way or another, the dropping off of the chains. "Jesus gave me a new life, new hope, and a new attitude. There are still chains and we are still prisoners, but we are prisoners of Christ and our chains are of being partakers of the afflictions of the Gospel (2 Tim. 1:8). "This book has been such an inspiration to me. I pray that as I prepare to leave this place and return to my Christian family that I will never let its meaning depart from me. I have not read many books in my life, but I do believe that this book is the second best I've ever read. I need not make mention of the first." Pray that God will destroy the power and influence of Satan and his kingdom over Roderick and his family. Pray also that God will preserve Roderick's faith and help him become mighty in spirit, as he prepares to return to his Christian family. Pray that God will meet the needs of Roderick's family. "I want to thank you for coming to [left blank] on Monday afternoons to bring a message of hope. Your Chicken Soup messages are very uplifting which we inmates need most. "Your studies of Proverbs are very helpful to my salvation and keep me walking with the Lord Jesus. I have signed up for correspondence Bible studies. "We are still having trouble with the pass system. More inmates would like to attend your Bible class but can't get passes. Thanks a lot for the years you have worked at prison ministry carrying God's Word to us inmates. Pray that God will give him a strong desire to study the Bible. Pray that inmates will have an easy time getting passes to the Bible class. "I was reading this book called Black Samson and it touched me in a special way. "I am an inmate, incarcerated here at [left blank]. One day as I was going to the porter closet, I saw some religious books, mostly Bibles, that other inmates left behind. "But there was one book that really caught my eye. It was Black Samson. I myself am from [left blank], where I never saw or read this book before. Most of the guys down here are from Cleveland, Ohio, and most say that they have read that book. "I have just finished reading Black Samson and the life and realization that Maweja has lived is quite similar to mine. "I am in prison for something that I thought was right at the time. I was bound in slavery to Satan. In the short time I have sent here, I have been at war within myself to bring myself back to my Lord Jesus Christ. My war is very similar to Maweja's. One step at a time, I find myself being set free by God's grace. Being in here (prison) things happen every day that make me want to change my mind and continue living the path the world sees fit. I am beating myself for getting myself in this situation. The anger inside me is slowing down my walk with the Lord. See, because I'm in prison doing time, my family is on the outside doing time, too. That makes me want to hate myself. I do love Jesus. I am having an extremely hard time understanding His ways. I know in my heart they are right. Maybe I do understand His ways. I'm just compromising within myself to fulfill the needs of my flesh. I guess the help I really need is in fellowship with other Christians. The head chaplain of one of the largest prisons in our area spoke at our church service, giving an update and sharing with the people the contribution we have made as a ministry. He pointed out that a study was made by the Center for Social Research which showed that inmates who participate in a Bible study can reduce the likelihood of inmate recidivism. The research findings specifically reported that only 14% of prisoners, who maintained a high level of participation in a Bible study like ours, were rearrested within a year of their release from prison, compared with 41% of prisoners who attended no Bible study. The state of Ohio spends $14,000 to keep an inmate for one year. The chaplain pointed out that if only ten inmates that we minister to do not come back to prison, we have saved the state $140,000. If a hundred inmates do not come back, we have saved the state $1,400,000 - not a bad return for your investment in this ministry! Just imagine if we would receive only 1% of what the state saves as a result of our presence and continual contribution from our Bible studies! I fell to my knees one night. This time it was out of fear or fright. Which Satan has brought to stay. I heard a sermon from a man who said there was hope. Jesus Christ is the way for me. This Chaplain Mario made it easy to see. It was tearing my insides apart. I gave my life to Jesus our Lord. Praise God Almighty, I'm now aboard! Send us your e-mail address. You can now subscribe to this newsletter online and receive it in your personal e-mailbox. You can also view it in color on the World Wide Web. Thank you letters and receipts can be sent by e-mail, saving our ministry the cost of stationery, envelopes, addressing, and postage. Plus, e-mail is faster than regular mail. (even if you're not sure) or we may never know!